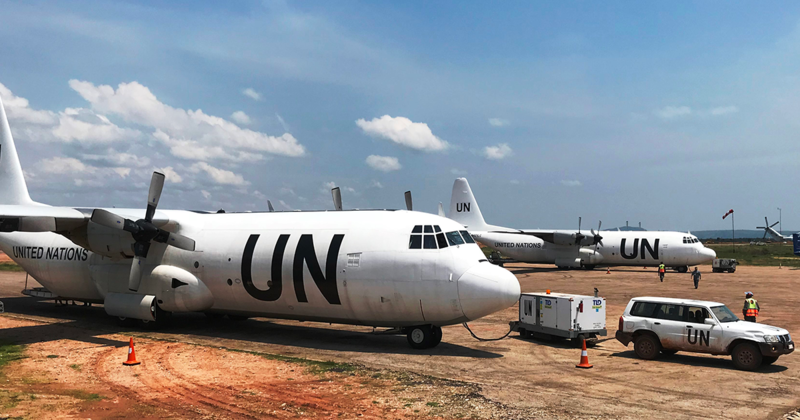 Lynden Air Cargo recently completed a three-month peacekeeping mission for the United Nations (UN) to ensure safe and legal elections in the Democratic Republic of Congo (DRC). It also established a new line base in Accra, Ghana, to provide parts and repairs to its aircraft serving the Middle East North Africa (MENA) region. "This photo (pictured above) is of our two planes at our new maintenance base in Accra, Ghana," says Jim Davis, Vice President Commercial Operations. "As our footprint increases in the MENA region, it has become important for us to build a line station facility with a large inventory of aircraft parts. This will save shipping costs, allow us to get the parts to areas where we operate more quickly, and improve our repair time which will have a direct impact on customer satisfaction." During the peacekeeping mission Lynden's main operating base was in the DRC capital city of Kinshasa, but both Lynden planes were also positioned in other locations to help move cargo throughout the country and into Entebbe, Uganda, which is the regional logistics hub for the UN. "One of the two aircraft was also temporarily positioned in Kenya to help move cargo out of Mombasa to Kalemie, Goma, and Kinshasa," explains Project Manager Rock Molanga. "Compared to the previous UN peacekeeping mission we supported in 2016–2017, this one was more complicated because of the current political and security situation in the DRC. The president has been out of mandate since December 2016 and this election was already postponed twice. The elections finally took place Dec. 30 and Felix Tshisekedi was elected president in the first democratic transition of power in the country's history." Over the two years Lynden was onsite, the elections were plagued by problems such as fire that destroyed the voting machines, militant attacks and an Ebola outbreak. In addition to supporting the electoral process in developing countries, Rock is confident that Lynden Air Cargo will have many opportunities in the MENA region in the future. "The UN is present in most of the post-conflict countries in Africa." Lynden's aircraft capabilities are well-suited for the area because of the lack of infrastructure and roads throughout the African continent.